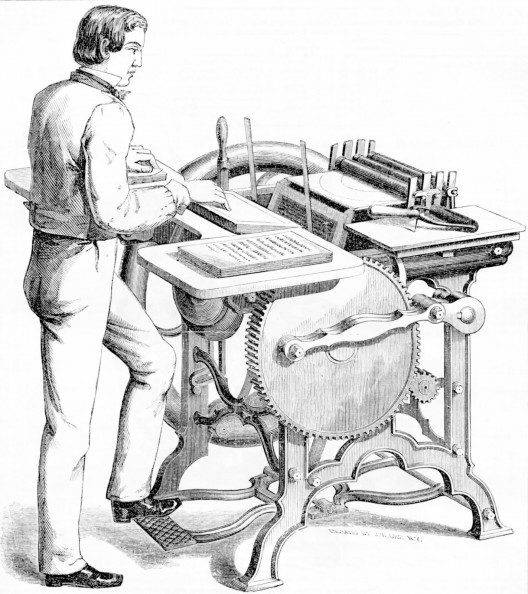 The earliest attempt at making a treadle-operated press with a hinged platen was that of Daniel Treadwell (1791-1872.) Treadwell, an American living in England, devised a press and had the Scottish press builder David Napier to build it in 1821. It was made of wood, and incorporated a rotating ink disk for the first time. A lack of interest by British master printers, and hostility by workers, led Treadwell to abandon it. He returned to America and became a professor at Harvard in 1835. Printer John Kitchen (1804-1852) of Newcastle-on-Tyne patented a crank-operated clamshell platen press in 1834 (UK patent 6454) but was unable to have it built, and in 1839 he emigrated to Australia.
. . . 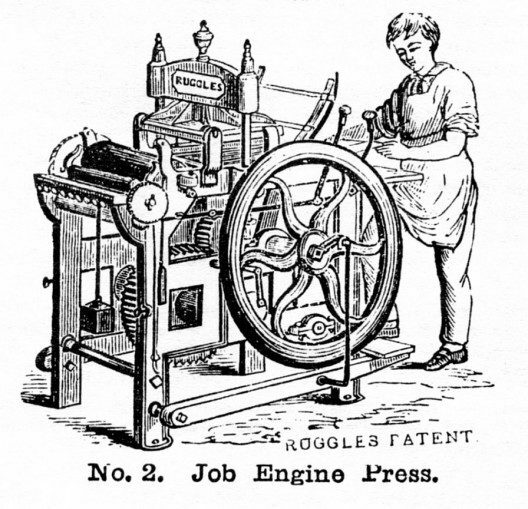 I have, in times gone by, most cheerfully accorded to Ruggles the introduction—the origination—of the treadle job press. I have ever said the conception was YOURS, and that your efforts, skill and persistency against great opposing obstacles introduced it. Glory enough for one man . . .I shall be ready, ever, to accord my testimony . . . to set you right in the eyes of the world, as the pioneer and the great prototype of job printing-presses; and the one which all other builders have taken as their great model . . . Had it not been for Stephen P. Ruggles I should not have been where I am today. I should never have built a printing-press. . .
Stephen P. Ruggles was born July 4, 1808 in Windsor, Vermont. He was apprenticed to a printer there, but his mechanical bent appeared early. While still an apprentice he made an early attempt at inking the forms of a hand press by means of an automated roller. In 1826 he went to Boston, which at that time was a center of press invention and building. He worked as a pressman, and in his spare time devised and built a cylinder power printing press on which the Ladies Magazine was printed. This press was operated by Ruggles in the office of Daniel Fanshaw in the American Tract Society building in New York. The press was able to print enameled cards and became a great favorite with printers and “a source of considerable profit for several years” to Ruggles. No picture of this press is known, but it should be noted, lest we think of it as a modern jobber, that it was built of wood. We have the authority of Thomas MacKellar that “he built another wooden press, on the same plan, for the use of George P. Gordon in his business of card and job printing.” This meeting of Ruggles and Gordon was to have a major impact on the development of the platen press. Although this press was a great advance, it left room for improvement. It was known among printers as “the upside-down press” because the bed containing the form was placed above the platen, which moved upward to make the impression. About 1500 to 2000 impressions per hour were possible, a great improvement over the 250 impressions per hour of the hand press – which usually had two men to work it. For several years after this Ruggles invented machinery for printers, including stereotype plate shaving machines, lathes, and gear-designing apparatus. In 1849 he returned to presses with the Ruggles Rotary Job and Card Press, from which the modern platen jobber is descended. Some of the features of this press were the same as in his earliest card press of 1831, but now arranged in a more convenient manner. 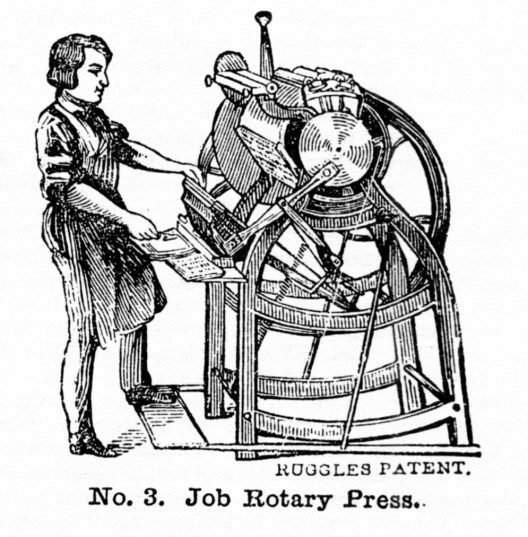 Ruggles’ Rotary Job Press of 1849 – the direct antecedent of the modern platen job press. In 1854 Ruggles sold all his patents and the good will of his business to the S. P. Ruggles Power Press Manufacturing Co. in Boston, and retired with a fortune of over $500,000. He sold out at the right time, because George Gordon’s presses were beginning to take away his market. But he continued to invent; in 1859 he received a patent for an iron hand press that made use of a screw – the patent model is on display at the Smithsonian and the only known full size press is in the stacks at Harvard’s Houghton Library. Ruggles died in 1880. The following year, 1851, Gordon brought out his “Alligator” press. The press was reliable and fast, although its snapping jaws were an ever-present danger to careless printers’ fingers. It had a good sale for several years. The only known surviving Alligator is owned by the Nebraska State Historical Society and is currently on loan to the International Printing Museum in Buena Park, California. The press was called the “Turnover” because of the novel movement of the platen. Within a few years Gordon had simplified and improved it greatly. By 1858 it appeared essentially in its final form, and was named the Franklin press; this is the press that Gordon, a spiritualist, said had been described to him by Ben Franklin in a dream. George Phineas Gordon’s Franklin Job Press, described to him by Ben Franklin in a dream. From The Printer, New York, 1858. Although Gordon sold thousands of presses during his career, most were made for him by outside machine shops. 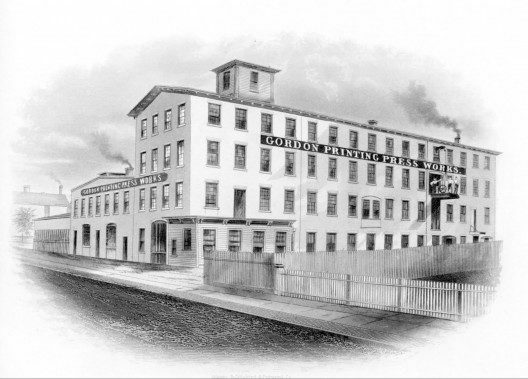 At the height of the press’s popularity, however, in 1872 Gordon built his own factory in Rahway, New Jersey, with a capacity of 600 presses a year. (In 1901 the factory and right to use the name Gordon on its presses were bought by Chandler and Price.) The factory closed down in 1909. Gordon Printing Press Works in Rahway, NJ. Note the platen jobber on the exterior elevator. 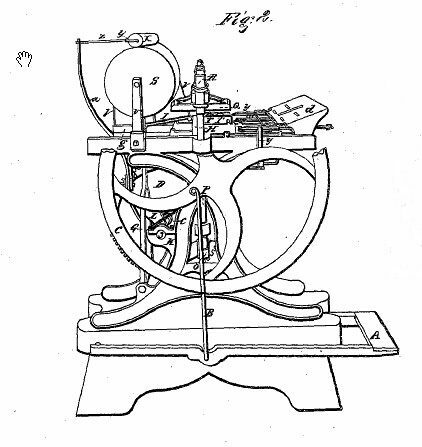 When the time for his patents to expire drew near, Gordon devised some changes for an Improved Franklin press. One of these was a throwoff, which had been in use on other presses for some time. This press was known in the trade as the “brass arm” Gordon because of a brass name plate on one of the side arms. It never was as popular as the “old-style Gordon,” but it was made and sold in various forms and under eighteen different manufacturers’ labels. 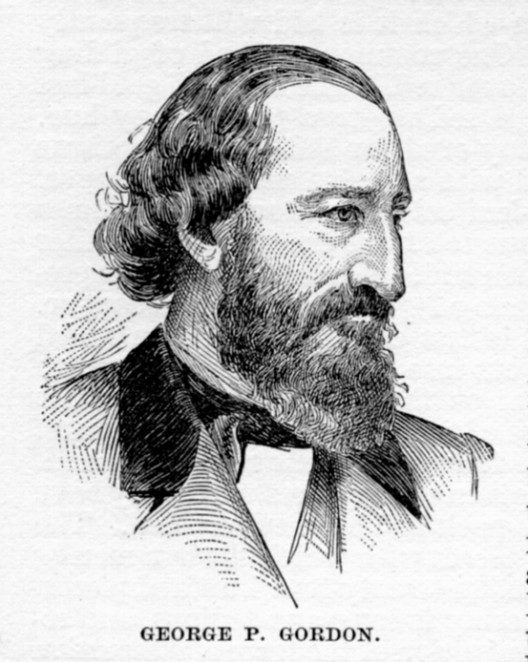 Gordon died January 27, 1878, and left a fortune that was estimated at almost a million dollars. His will was known to exist, but it took his family twelve years to find it. His real legacy was a printing press that became almost universal in printing offices, and which even today can be found in operation in every country in the world.